I have a confession to make. I only discovered Greek yogurt about 6 months ago. I know what you’re thinking: How could I possibly have overlooked this deliciousness? It’s not even as if I didn’t eat yogurt at all, because I did. Plain yogurt, too. Lots of it. I had just always assumed that Greek yogurt was a marketing ploy to get me to pay more money for fancy yogurt and I wasn’t about to fall for it. But one day while grocery shopping, they were out of my usual Stoneyfield Farms plain yogurt and I was left to decide between buying presweetened, flavored yogurt or finally giving in and giving Greek yogurt a try. As it turns out, I’ve never been so happy to see the grocery store out of something I wanted. For the few of you who may still be Greek yogurt holdouts, it is so much better than regular yogurt. Give it a try even if you don’t particularly like regular yogurt. Its so rich and creamy that it seems more like a decadent dessert than a healthy breakfast food. So much so that even my yogurt-hating sweetie, Chris, kind of likes it. And believe me that’s saying something, as I’ve spent a fair amount of kitchen time experimenting with just how much of a recipe’s sour cream I can replace with yogurt before he notices. Now that I’ve discovered the edible delight that is Greek yogurt, I eat it nearly everyday for breakfast. I whip up a quick little mix of yogurt, fruit, and nuts that’s a lovely light breakfast for these warm summer mornings. Despite being on the lighter side, it has plenty of protein and healthy fats so it’ll stick with you for awhile. And if that’s not enough for you, it’s also chock full of probiotics and antioxidants to keep you feeling young and healthy. As far as I’m concerned, it’s the perfect summer breakfast. Since I tend to get bored eating the same old food everyday, I like to mix it up once in awhile with different berries, or sometimes peaches or mango, and different types of nuts. I’ll also switch up the sweetener occasionally and use some maple syrup instead of the honey. Actually, I hesitate to even call this a recipe. It’s really more of a guideline, so go ahead and use this a jumping off point to make it your own. Most of the time, I make this using thawed frozen raspberries rather than fresh. I actually prefer it this way because the juices from the thawed raspberries mix into the yogurt and I think it gives it a better flavor. 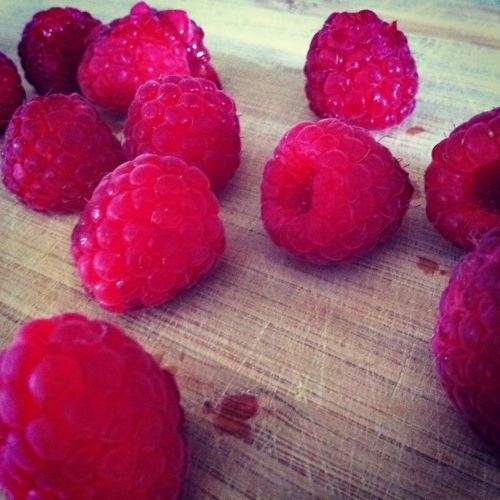 Also, it can be tough to find organic fresh raspberries around here (not to mention expensive) so frozen is just easier all around. The visual appeal of the frozen raspberry version is a bit lacking however. To be honest, it just looks like a bloody mess (and I don’t mean that in a British slang kind of way) so I chose to use fresh raspberries for the pictures. Either way, it’s a tasty way to start your morning. Stir the honey into the yogurt until well combined. 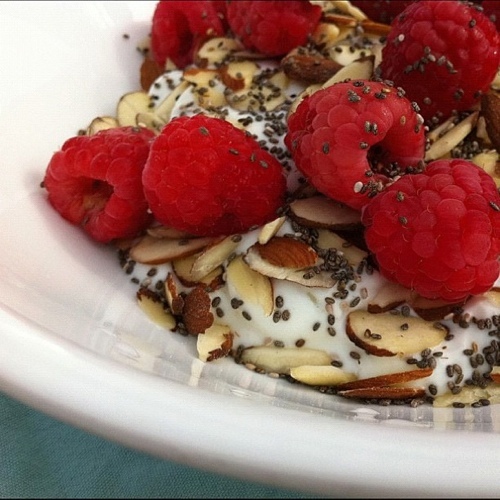 Top with the almonds and then the raspberries. Sprinkle the chia seeds overtop and enjoy.